Japanese IT giant Fujitsu has announced that its Digital Annealer technology will be used by NatWest bank to solve financial investment problems and optimize the mix of liquid assets that include bonds, cash and government securities. Digital Annealer is a ‘quantum-inspired’ cloud service that emulates qubits – the basic units of quantum computing, able to simultaneously represent both 1 and 0 – in a digital circuit. At the moment, the deployment is just a Proof of Concept (PoC) – but it shows how quantum computing could be used to solve real-world issues. “Given our first application of quantum-like computing power has been so successful we think the technology could be applied to many other calculations and problems the bank faces on a daily basis,” said Kevin Hanley, director of innovation at NatWest. Digital Annealer is not a true quantum computer – rather, a digital circuit inspired by quantum phenomena, designed to solve complex combinatorial problems. Unlike true quantum computers, which require temperatures nearing absolute zero (−273.15°C), Digital Annealer can be operated at room temperature. The current iteration of the system uses 1,024 bits, which have full bonding connectivity. Fujitsu’s Digital Annealer was announced in 2016 and launched as a commercial cloud service in May 2018, alongside specialized software developed by Canadian startup 1Qbit. According to Fujitsu, optimizing the mix of financial assets of a bank while maintaining acceptable levels of risk is a complex task, typically requiring considerable investment of time and money. The company claims that its Digital Annealer can process such workloads up to 300 times faster than traditional compute servers, and with a higher degree of accuracy. “While quantum computing is still in its infancy, we’ve taken inspiration from its approach to offer our customers access to digital annealing, which is an advanced and powerful acceleration technology available today,” said Joseph Reger, Fujitsu Fellow and CTO for EMEIA. 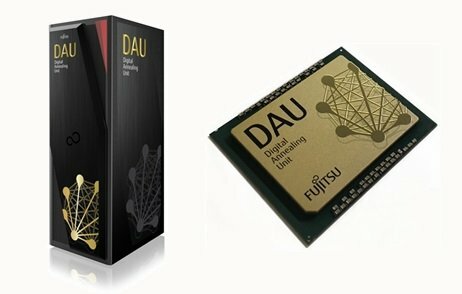 Fujitsu is currently working on a specialized Digital Annealing processor, called the Digital Annealing Unit (DAU), which will enable it to tackle computational challenges on a larger scale.